Try as the climate sceptics might, the evidence for human-enhanced climate change is irrefutable. Three reports this year from the UN’s IPCC (Intergovernmental Panel on Climate Change) tell the story. The work is credible as it involved 2,500 scientists, subject to peer review, and was open to public scrutiny. While the detail of the reports is immense, the message is simple — reverse human-induced climate change or bear the consequences. What must the Church do to help people respond to climate change? Cardinal Martino, as President of Pontifical Council for Justice and Peace, hosted a seminar on Climate Change and Development last April. Climate sceptics were invited as well as church leaders who want to build a community based pastoral response to climate change. The seminar carries lessons for the Australian church. The first task of the church is to expose science sceptics. Archbishop Pat Kelly of Liverpool reminded Italian scientist Professor Zuchichi that there is little place for science that is removed from the real lives of people. A rational, equitable and moral response to climate change means using available carbon-reducing technology as outlined by the IPCC. 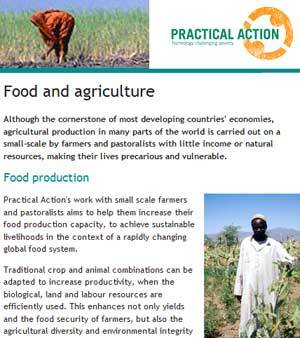 Some vested interests have to be exposed as a block to effective climate responses. Their PR people sow the confusion that leads to paralysis and push misleading positions: make developing nations rich so they can adapt to climate change; technology will solve agricultural problems in development nations; the increase in atmospheric carbon dioxide is good and willed by God. Sadly, vested interests often play on the good will of ordinary people. Under the banner of concern for the poor they argue against carbon taxes. At the Rome seminar they ignored the testimony of people like Ms Sharon Looremet of 'Practical Action Kenya' and Archbishop Paul Ruzoka of Tanzania. While connecting poverty and climate problems, these two speakers rejected imposing western models of agriculture which had helped cause problems. David Miliband, Minister for the Environment in the UK government speaking at the seminar, asked the churches to add a moral and ethical tone to the climate debate. He called for an 'Environmental Contract' similar to a 'Social Contract' and praised Pope Benedict for buying the first bond in the UK’s carbon trading scheme. The insights of Kubler-Ross on responses to health trauma also apply to the psychology of climate change. 'De-nial' is not a river in Africa. At the seminar some blamed countries such as China for increasing climate gas emissions or Indonesia for its forest fires in an attempt to divert attention. Some Australians use the same arguments, yet for financial purposes we still import cheap Chinese goods and Indonesian forest timbers. There are a number of ways that churches can constructively enter the debate on climate change. First, churches can more actively enter the public debate on climate change by providing cogent ethical criteria — the right of all people to a safe environment as taught by John Paul II, the rights of future generations, fair distribution of climate abatement costs, solidarity with developing countries which need modern technology uninhibited by patenting laws, the plight of environmental refugees. In an election year, the Australian bishops need to be encouraged from the pews to publicly build upon their 2005 position paper on climate change. Second, the churches can provide motivation for people to act on climate change by bringing from its store 'new things and old'. The role of earth in the story of Christian salvation develops as we listen to the earth groaning. The revealing role of Earth for spirituality can grow through preserving its diversity. In his closing address, Cardinal Martino said, "This reflection deepens doctrinal reflection as Gospel meets life in society...the Gospel is always new, adapting as historical conditions change." Third, many participants in Rome called upon the Pope to write an encyclical on the environment and join with major church leaders in a common statement on climate change. Church leaders in Australia could ask why the new endowment fund for universities does not carry a condition that new buildings have a five star energy rating, for example. Church groups could talk about 'green jobs' to break the link between economic growth and increased climate gases as the UK has done. Bishops could designate a part of World Youth Day 2008 to reflection and action on the universal issue of climate change. Dr Charles Rue is a Sydney-based priest of the Columban Missionary Society, and co-ordinator of Columban JPIC (Justice, Peace and the Integrity of Creation). 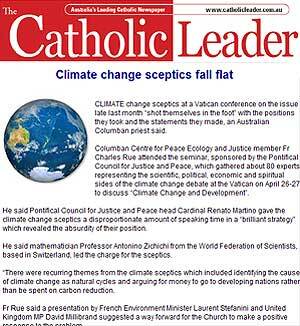 His report of the recent Vatican Climate Change Seminar is here. Recent articles by Charles Rue. It is indeed a good step towards the humanity. But I am afraid that the scientists and technologists may not cooperate. These people have lot of daydreams to be completed. Like getting a name, Noble prizes getting honors etc. The investors behind them want a fast buck, at the earliest. The rapid industrialization and the way the natural resources have been exploited at different places of the earth are examples of how the man with his great brain is dangerous to not only to his own community but also to the lives on this earth. Some of the great scientists have accepted after their inventions like Noble, who founded the organization to reverse his invention and instituted Noble prizes. Similarly Einstein after extending the theory of photon, to E = MC2 said that he wishes to take birth in India the spiritual country, if there is any rebirth. How noble and humble they are and what mean mentality present scientists and technologists are. This cleaning of the atmospheric waste and mental pollution is not one mans job, everybody should come forward and do what ever they can do, to clean not only their minds but also environment. There is no barrier of religious or race or region for the Humanism. Let us do it by. I pray to that God almighty to give us the vigor and strength to do that. As with the theory of evolution there are no facts supporting the theory of climate change and global warming but simply biased and specially selected and isolated observations. I have read earlier this year a call from some radical supporters of the theory that climate change sceptics should be charged, placed on trial and gaoled for their "crime". Abraham Lincoln once famously said "You can fool all the people some of the time, some of the people...[etc.]" As with the Y2K bug scam this theory will not stand the test of time. If, as John McMahon writes, there has been a call from some for climate change sceptics to be charged, placed on trial and gaoled for their "crime", then I must share his concern at such outburst of Maoist zealotry. Anyone who doubts that there are facts supporting the theory of climate change should read the 1890’s Nobel Prize-winning work of Svante Arrhenius, then learn some undergraduate physical chemistry, before following the last quarter century of observations as reported in, say, New Scientist magazine. Science coverage in the media is dominated by boffins and nerds in lab coats . It loses out to “real” stories of politics and economics in the serious broadsheets, magazines and current affairs programs, and to crime and celebrities in the tabloids and to infotainment on TV. We can only imagine the shelves of an online bookshop to be dustless. But this does not preclude the very real presence of the spirit of a close relative who died two decades before the Internet took hold.